As the surest sign that Dr. Nitin Goyal delivers exceptional care, his patient testimonials are glowing. Below are just a few examples of what they had to say about their experience. Nitin Goyal is an excellent orthopaedic surgeon and I would recommend him highly. I have osteoarthritis in my left hip that deteriorated rapidly to the point where walking was just so painful. At 54, it was changing my quality of life and I could not even walk, which was a daily activity that I would do 3 times a day. I did a lot of research and decided to go with the anterior approach to hip replacement because it was minimally invasive and my recovery time would be shortened to 4-5 weeks from the 8-12 weeks that usually occurred with the posterior approach. From the beginning at Mount Vernon, the experience was excellent! Dr. Goyal is with the Anderson Clinic, and how they would work in coordination with Inova Mount Vernon is like clockwork. I met with Dr. Goyal and thankfully I was a candidate for the procedure. I found Dr. Goyal to be well credentialed and as well having an excellent bedside manner. He explained the procedure and answered all my questions. I told him I wanted to have it done quickly before I chickened out, and it needed to fit within my husband's business travel schedule. I was given 4 dates and 1 date fit into his schedule. It was less than a week away from my appointment. The pre-op tests and meeting with the case nurse and the physical therapist made me realize what a great choice selecting Inova Mount Vernon Hospital. Everything ran perfectly, and I had everything done in 3 hours! The surgery was scheduled for 7:30AM and had to be there at 5:30 am. My nerves were raw and I did have some crying spells. Everything was timely and everyone was so reassuring, from the admin person checking me in, the pre-op nurse, the anesthesiologist, to Dr. Goyal. After the surgery, Dr. Goyal saw me at 2:00 pm. He said I looked good and would meet with the physical therapist. If I could complete all the tasks she required, there could be the possibility of going home the same day. The physical therapist came and I was able to get up and do 1 lap around the nurse's station. I had an excellent doctor, excellent hospital staff and excellent physical therapy experience. Once I was home, the visiting nurse coming twice a week and the physical therapist 3 times a week has been great as well. I have my follow up appointment with Dr Goyal next week and have the possibility of going back to work the following Monday! I am just sorry that I waited so long to have the procedure done. I don't know where to start. From the moment we met Dr. Goyal, my wife and I have been so impressed. He came in with a smile and first got to know who we were and where we were from. He quickly identified what the problem was and he explained this to us in a way we could understand it. To be honest I knew my wife had a hip condition and had tried to read about it, but I never understood it until he explained it! He calmed our nerves so quickly. He took the time to explain the procedure, and risks, and he didn't sugarcoat things. When I asked questions he always referred to what the actual scientific studies had shown, he clearly knew what he was talking about. 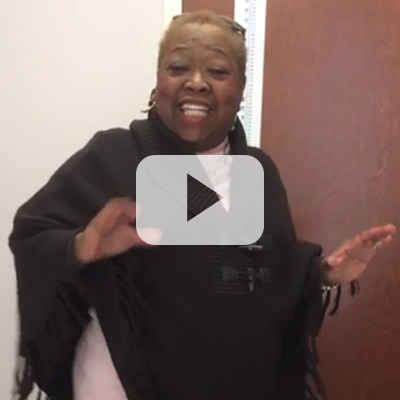 She had her hip replacement done at 8AM and walked out of the hospital at 2PM! She literally walked up our steps when we got home. I couldn't believe it. She even said she had less pain than before surgery... it was astonishing! Now she is 4 1/2 months post-op, and has basically forgotten that she had a hip problem. She's even back to hiking. Her scar looks like in a bit of time it may be gone. We had been to see two other surgeons for my wife's hip and neither had been too impressive. They both were the local doctors, one of which had fixed my elbow a while back. I knew that if she needed a hip replacement, I wanted someone who ONLY did replacements to do it, so that’s why we started looking around. Dr. Goyal only treats complex hip and knee problems. I was so impressed with his surgical skill, that I have recommended him to all my family and friends and even am scheduled to have a knee replacement myself in 2 weeks! When we were talking about our kids and where they go to school, Dr. Goyal said he grew up very near by, and I asked him which high school he went to. The moment he said Thomas Jefferson High School (for science & technology), I knew that he was a sharp guy, but I am so astonished by the whole process. I wholeheartedly recommend him to everyone! Dr. Goyal was wonderful. He fixed my painful hip. I was at home the same day and back at work in 2 weeks. 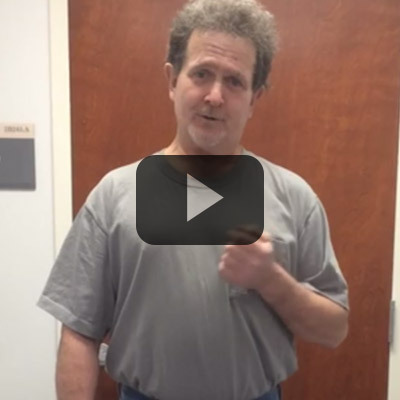 He did this new direct anterior approach to hip replacement. He is a miracle worker. I am so thankful I found him. I was born with dislocated hips. When I turned 28, they started to hurt to the point it was hard to walk. I have been to several doctors and they all said it is mental. They never took the time to take x-rays or anything else. Dr. Goyal is the only doctor who took his time to listen to me and to examine me properly. Come to find out I have hip dysplasia and need a total hip replacement. I am so thank for Dr. Goyal. If it were not for him, I would not know what is wrong with my hip. Doctor Nitin Goyal accepted the challenge of treating my husband’s chronic knee problem and saved his life. Over a 12 years period, the disease that was destroying my husband knee joint had not been diagnosed properly. By March 2012, my husband was in excruciating pain, had a fever and could barely walk. At that point we went to see Dr. Goyal of Anderson Orthopedic Clinic, who assembled a team of medical experts. Together they came up with the correct diagnosis and devised the proper treatment. Dr. Goyal then performed a two-stage surgery: The first one to remove the infection and treat the bone, then the second one to put in place a prosthetic knee. Thanks to Dr. Goyal’s competence as a surgeon, my husband has now a proper knee joint so he can walk, and he has recovered his health. 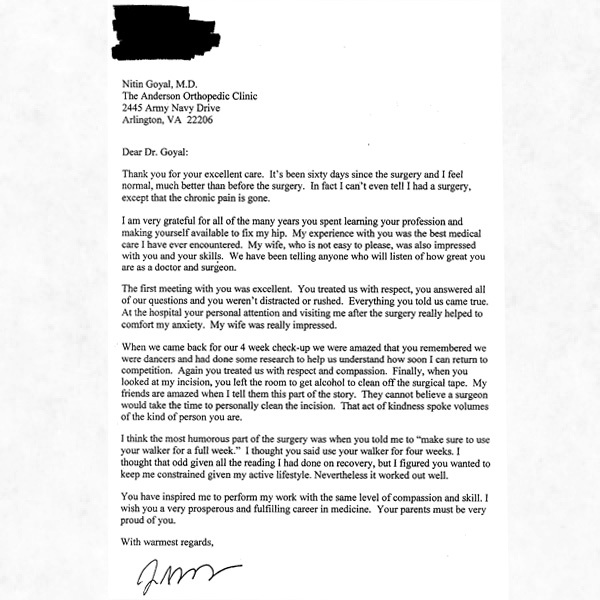 We appreciate the professional honesty and human touch of Dr. Goyal of Anderson Orthopaedic Clinic at Inova Mt. Vernon. He shows concern for you and your recovery, and we could not dream of a more skillful surgeon. 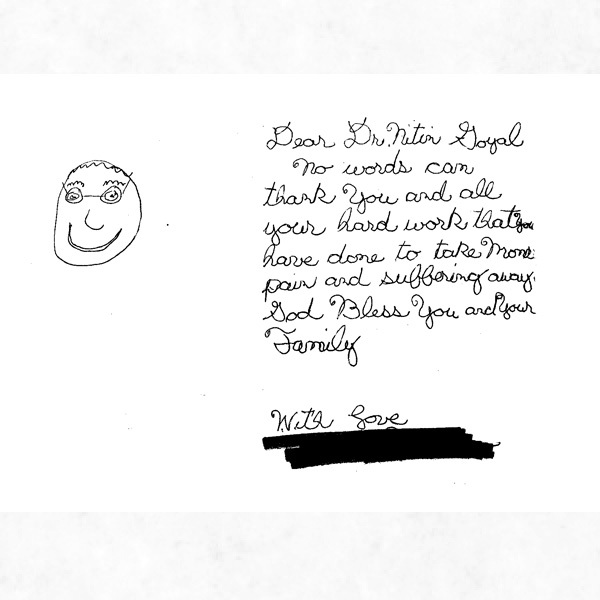 We are very thankful and we highly recommend him to anyone considering a knee replacement. I had disabling pain in my hip, and Dr. Nitin Goyal took care of me. He's a superb doctor and is the only one who took the time to listen to me, answer all of my questions and make sure I felt comfortable. I am so happy I chose him to do my surgery. I think he is one of the top hip replacement surgeons in the Washington, DC / Northern Virginia / Maryland area, and I would recommend him to anybody and everybody! I talked to an orthopaedist friend in Illinois who said that the Anderson group is world-renowned in the field of hip and knee replacement. So happy I ended up there! Dr. Goyal did an anterior approach hip replacement and I could not be happier. Thank you to Dr. Goyal and his staff at the clinic for taking such great care of me. An exceptional doctor and surgeon -- I was referred to Dr. Nitin Goyal following a severe motor vehicle accident in which I sustained a broken neck, fractured ribs, and shattered right pelvis. From the initial appointment in his office, Dr. Goyal, showed a genuine concern and grasp of my full medical issues. Dr. Goyal, shortly thereafter, performed a total right hip replacement, that has been a resounding success. When I first met him, I was in a wheelchair, in fact I presented to the hospital in a wheelchair, and 4 hours later, walked out of the hospital with minimal help. Dr. Goyal, is simply one of those incredible doctors who is not only pleasant to talk to, but an exceptional practitioner. 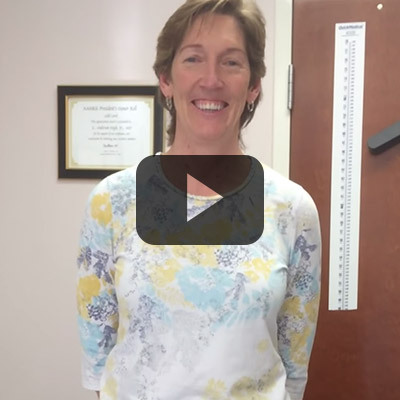 If you need an orthopedist who listens, gives great guidance, and is an incredible patient care advocate. He's the one. Eight weeks ago, Dr. Goyal replaced my left hip using the anterior approach. I have severe osteoarthritis, and will have my right hip replaced next month, also by Dr. Goyal. Recovery has been rather easy, and I have no pain whatsoever in the left hip. I highly recommend Dr. Goyal for his professionalism, his bedside manners, and most of all, his skill as a surgeon. Great doc! Went to see him about my knee problem...I didn't need surgery but he gave me an injection and it completely took the pain away. I thought I was going to need a knee replacement, but he said my knee looks like the knee of a thirty year old! I'm a physical therapist and I actually saw Dr. Goyal do a live surgery at a course that he ran at the hospital. Wow, I cannot ever imagine a smoother surgery. He did a direct anterior total hip replacement on a male patient in about 40 minutes while he talked us through it also! He was so meticulous and there was essentially no bleeding. I couldn't believe the technique. We saw the patient come in to the lecture hall at the end of the course, about 4 hours after the surgery, and the patient was actually leaving the hospital! We asked the patient how much pain he was in and he said NONE! I felt so good about Dr. Goyal that my mom needed a hip replacement and I brought her to his office. He did it almost 5 months ago and she is doing wonderfully. He's a down to earth, really nice guy and spent time with us explaining the surgery and the recovery process. She left the hospital on the day of the surgery and she has had the smoothest recovery possible. I strongly recommend Dr. Goyal to anyone who needs a total hip replacement! I had both of my knees replaced by Dr. Nitin Goyal. He is a phenomenal doctor and I think he really is the best orthopedic surgeon in d.c.. He did minimally invasive partial knee replacements on both of my knees and I recovered quicker than I could have ever imagined. He was so patient with me and my questions in the office and his staff was very thorough. Pat his nurse went through things in such good detail. Since I wasn't even going to stay in the hospital a night his nurse even gave me all my prescriptions ahead of time so I didn't have to go to the drugstore the night of surgery. I saw his physicians' assistant too, Sarah, and she was wonderful. His staff gave me a temporary parking permit when I needed it and got back to me quickly whenever I called in. All of the hospital staff talked about Dr. Goyal like he was the best knee surgeon in the area and were so impressed with how all of his patients do. Apparently his patients usually leave on the day of surgery. Go see Dr. Goyal! Doctor Nitin Goyal accepted to take up the challenge of treating my husband’s chronic knee problem and saved his life.... Over a 12 years period, the disease that was destroying my husband knee joint had not been diagnosed properly. By March 2012, my husband was in excruciating pain, had fever and could barely walk. At that point we went to see Dr Goyal of Anderson Orthopedic Clinic, who assembled a team of medical experts. Together they came up with the correct diagnostic and devised the proper treatment. Dr Goyal then performed a two stage surgery: The first one to remove the infection and treat the bone, then the second one to put in place a prosthetic knee. Thanks to Dr Goyal’s competence as a surgeon, my husband has now a proper knee joint, can walk, and he has recovered his health. We appreciate the professional honesty and human touch of Dr Goyal. We could not dream of a more skillful surgeon. We highly recommend him to anyone considering a joint replacement. I became a patient of Dr. Nitin Goyal, orthopedic surgeon, in July, 2012 as I was having health issues with my right knee. During my office visits with Dr. Goyal, he observed difficulty with my knee. He always was concerned with my condition and continued to monitor it. During the year of 2013 and part 2014, I was having some other major health issues. However in the beginning of 2014, I was regaining my health and especially strengthening my weaken immune system. A few months into 2014, I continued to have office visits with Dr. Goyal to the point my health had improved significantly including my immune system. This put me on track for a complete right knee replacement on July 14, 2014 performed by Dr. Goyal. The operation was a complete success. Dr. Goyal has always shown his personal concern with my right knee. After 7 months, I have been very please with the results and I thank Dr. Goyal for his personal concern for me. Finally, without reservation, Dr. Goyal has enhanced the quality of my life!!! Excellent surgeon -- surgery changed my life in a positive way. At the beginning of 2012, I was experiencing health issues with my right hip including painful walking and other aspects of my daily routines. Having consulted with another orthopedic doctor, it was necessary to pursue further options. In my searching for other doctors, I was referred by others who had positive and successful experiences with the Anderson Clinic. Therefore, in July 2012, I scheduled an appointment with Dr. Nitin Goyal. It was after this appointment with Dr. Goyal , I was persuaded by the diagnostic evaluation including X-rays plus his expertise in orthopedics, that I should have right hip replacement surgery. Further, Dr. Goyal displayed excellent bed side manners. 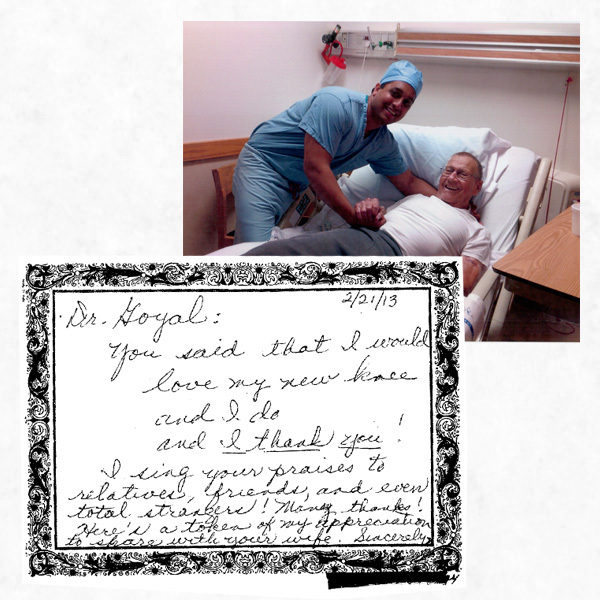 I was convinced with the facts and Dr. Goyal to make a commitment to have right hip surgery. I was relieved and comfortable with my decision based on the evidence. In the days ahead leading to the surgery of August 2012, I was relieved and comfortable with my decision. The orientation and preparation was conducted by INOVA Mount Vernon staff with the best result for my readiness. Just as smoothly Dr. Goyal completed an anterior approach on my right hip without complications. Dr. Goyal visited me in the recovery room with the same excellent bed side manner that he had previously exhibited. Post-surgery I was overjoyed especially with relief and the absence of pain. In fact, I speak of Dr. Goyal as my HERO because he changed my life. As my recuperation continued at home with a visiting nurse and physical therapist as well follow up physical therapy, I eventually followed up with Dr. Goyal. It is with gratitude to Dr. Goyal and all other persons who facilitated this experience, my quality of life has improved significantly. My comfort level during all aspects was stimulated by my confidence with Dr. Goyal as my advocate. Without reservations, I would recommend Dr. Goyal as an excellent (rare goodness) orthopedic surgeon. BRAVO! I had both of my knees replaced by Dr. Nitin Goyal. 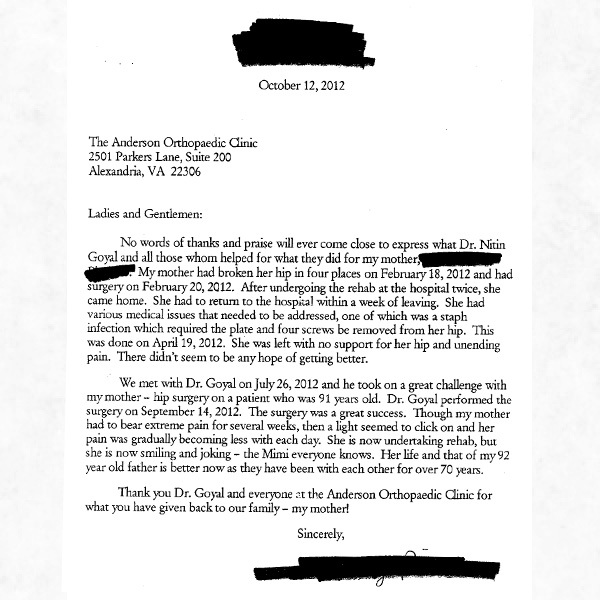 He is a phenomenal doctor and I think he really is the best orthopedic surgeon in D.C.. He did minimally invasive partial knee replacements on both of my knees and I recovered quicker than imaginable. He was so patient with me and my questions in the office and his staff was very thorough. Pat his nurse went through things in such good detail. I had them done as an outpatient and she even gave me all my prescriptions ahead of time so I wasn't going to the drugstore after surgery. I saw his physicians' assistant too, Sarah, and she was wonderful. His staff gave me a temporary parking permit when I needed it and got back to me quickly whenever I called in. All of the hospital staff talked about Dr. Goyal like he was the best knee surgeon there and were so impressed with how all of his patients do. Apparently his patients are the ones most likely to walk and leave on the day of surgery. go see Dr. Goyal! Three days ago I had a total hip replacement by Dr. N. Goyal and his team. It has been an amazing experience. First, from the time I had my first appointment to meet Dr. Goyal, through the pre-operative sessions, admission to the hospital and the surgery itself, i found everything ran in an organized, professional, manner while showing the utmost care for me as a person and patient. After the surgery, Dr. Goyal not spoke with my husband and came to see me, but he then came, got me up for my first walk, took me to the gym and personally supervised my exercises making sure I understand what he wanted me to do. I was discharged home 7 hours after the surgery... feeling very good. Being home has been the best possible way to recover and I'm optimistic that I will do so in record time. Not only did his nurse call the next day, but I had two calls from Inova Mt. Vernon Hospital to review instructions and make sure all was OK. I never felt rushed and was given numbers to call if needed. VNA and PT are visiting at home. I am nearly pain free on day 3 post-op. Thank you to Dr. Goyal and to all the staff for an excellent experience. I'm a physical therapist and I actually saw Dr. Goyal do a live surgery at a course that he ran at the hospital. Wow, I cannot ever imagine a smoother surgery. He did a direct anterior total hip replacement on a male patient in about 40 minutes while he talked us through it also! He was so meticulous and there was essentially no bleeding. I couldn't believe the technique. We saw the patient come in to the lecture hall at the end of the course, about 4 hours after the surgery, and the patient was actually leaving the hospital! We asked the patient how much pain he was in and he said NONE! I felt so good about Dr. Goyal that my mom needed a hip replacement and I brought her to his office. He did it almost 5 months ago and she is doing wonderfully. He's a down to earth, amazingly nice guy and spent time with us explaining the surgery and the recovery process. She left the hospital on the day of the surgery and she has had the smoothest recovery possible. I strongly recommend Dr. Goyal to anyone who needs a total hip replacement! Top knee replacement surgeon! what a wonderful practice. I'm so happy I found them. I came from Delaware but it was well worth it. Expertly run. Nitin Goyal is an excellent orthopeadic surgeon and I would recommend him highly. I have osteoarthritis in my left hip that deteriorated rapidly to the point where walking we just so painful. At 54, it was changing my quality of life and I could not even walk which was a daily activity that I would do 3 times a day. I did a lot of research and decided to go with the Anterior approach to hip replacement because it was minimally invasive and my recovery time would be shorten from 4 to 5 week from the 8 to 12 that usually occurred with the posterior approach. I went to a class regarding the procedure given by another doctor who is associated with Inova Alexandria Hospital. His explanation confirmed by research and I had already had a scheduled appointment with Dr Goyal the very next day. From the beginning at Mount Vernon, the experience was excellent! From the Valet parking in the yellow lot just outside of the orthopedic entrance. Dr Goyal is with the Anderson Clinic and how they would in concert with the Inova Mount Vernon is like clock work. I met with Dr Goyal and thankfully, I was a candidate for the procedure. He is one of 2 doctors in this practice so I don't know how many other doctor in the Inova network perform that minimally invasive anterior hip replacement approach. Sound crazy,but I specifically look for a young surgeon because I figured that would know the latest and greatest procedures and would not be stuck with the old way of performing surgery. I found Dr Goyal to be well credentialed and as well having an excellent bedside manner. He explained the procedure answered all my questions. I told him I wanted to have it done quickly before I chickened out and to fit within my husband's business travel schedule. I was given 4 dates and 1 date fit into his schedule. It was less than a week away from my appointment. The pre-op tests and meeting with the case nurse and the physical therapist made me realize what a great choice selecting Inova Mount Vernon Hospital. Everything ran like clockwork and I had everything done in 3 hours! I had the surgery in late September at 7:30AM and had to be there at 5:30 am. My nerve were raw and I did have some crying spells. Everything was timely and everyone was so reassuring from the admin person checking me in, the pre-op nurse, the anesthesiologist,to Dr Goyal. Dr Goyal saw me at 2:00 pm. He said I looked good and would meet with the physical therapist. If I could complete all the tasks she required there could be the possibility of going home the same day. The physical therapist came and I was able to get up and do 1 lap around the nurse's station. I had an excellent doctor, excellent hospital staff and excellent physical therapy experience. Once I was home the visiting nurse twice a week and the physical Therapists 3 times a week have been great as well. I have my follow up appointment with Dr Goyal next week and have the possibility of going back to work the following Monday! I am just sorry that I waited so long to have the procedure done. I don't know where to start here. From the moment we met Dr. Goyal my wife and I have been so impressed. He came in with a smile and first got to know who we were and where we were from. He quickly identified what the problem was and he explained this to us in a way we could understand it. To be honest I knew she had a hip condition and had tried to read about it but I never understood it until he explained it! He calmed our nerves so quickly. He took the time to explain the procedure, and risks, and he didn't sugar coat things! When I asked questions he always referred to what the actual scientific studies had shown -- he clearly knew what he was talking about. She had her hip replacement done at 8AM and walked out of the hospital at 2PM! She literally walked up our steps when we got home! I couldn't believe it. She even said she had less pain than before surgery...it was astonishing! Now she is 4 and a half months from surgery and basically has forgotten that she had a hip problem. She's even back to hiking. Her scar looks like in a bit of time it may be gone! We had been to see two other surgeons for my wife's hip and neither had been too impressive. They both were the local doctors, one of which had fixed my elbow a while back. I knew that if she needed a hip replacement I wanted someone who ONLY did replacements to do it so thats why we started looking around. Dr. Goyal only treats complex hip and knee problems. I was so impressed with his surgical skill I have recommended him to all my family and friends and even am scheduled to have a knee replacement myself in 2 weeks! When we were talking about our kids and where they go to school and Dr. Goyal said he grew up very closeby I asked him which high school he went to. The moment he said Thomas Jefferson High school (for science & technology) I knew that he was a sharp guy, but I am so astonished by the whole process. I wholeheartedly recommend him to everyone! Dr. Goyal was wonderful. He fixed my painful hip. I was at home the same day and back at work in 2 weeks. He did this new Direct anterior thing. He is a miracle worker. I am so thankful I found him. I have been born with dislocated hips. When i turned 28 they started to hurt to the point it was hard to walk. I have been to several Doctors and they all said it is mental. They never took the time to take Xrays or anything else. Dr. Goyal is the ONLY doctor who took his time to listen to me and to exam me properly. Come to find out I have hip dysplasia and need a Total Hip Replacement. I am so THANKFUL for Dr. Goyal. If it was not for him I would not know what is wrong with my hip. I am now 34 and will be getting my hip surgery done in 2014. Doctor Nitin Goyal accepted to take up the challenge of treating my husband's chronic knee problem and saved his life.... Over a 12 years period, the disease that was destroying my husband knee joint had not been diagnosed properly. By March 2012, my husband was in excruciating pain, had fever and could barely walk. At that point we went to see Dr Goyal of Anderson Orthopedic Clinic, who assembled a team of medical experts. Together they came up with the correct diagnostic and devised the proper treatment. Dr Goyal then performed a two stage surgery: The first one to remove the infection and treat the bone, then the second one to put in place a prosthetic knee. Thanks to Dr Goyal's competence as a surgeon, my husband has now a proper knee joint, can walk, and he has recovered his health. We appreciate the professional honesty and human touch of Dr Goyal of Anderson Orthopedic Clinic at Inova Mt. Vernon. He shows concern for you and your recovery, and we could not dream of a more skillful surgeon. We are very thankful and we highly recommend him to anyone considering a knee replacement. I'm from northwest, Washington, D.C. and I spent quite a bit of time looking for a knee replacement surgeon. So happy to have gone with Dr. Goyal. My knee is great and I'm loving it. Finally back to hiking! Dr. Goyal listens and gave me all the information I needed to know about my problem. He wasn't in a hurry to end the session. I had experienced waiting longer than my actual session :/ This was different. Dr. Goyal took time to explain and give me advise on what I should do. He was honest that the process is a "pain" but i needed to do it in order for the pain to go away. I didn't regret switching doctors. I had disabling pain in my hip and Dr. Nitin Goyal took care of me. He's a superb doctor who is the only that took the time to listen to me, answer all of my questions and make sure I felt comfortable. I am so happy I chose him to do my surgery. I think he is one of the top hip replacement surgeons in the Washington, D.C. / northern Virginia/Maryland area and would recommend him to anybody and everybody! So happy with the whole experience at Anderson clinic. I talked to a orthopaedist friend in Illinois who said that the Anderson group is world-renown in the field of hip and knee replacement. So happy I ended up there!He did an anterior approach hip replacement and I could not be happier. Thanks to Dr. Goyal and his staff at the clinic for taking such great care of me. I had terrible hip arthritis that was limiting my activity and causing me tremendous pain for more than 2 years! I saw Dr. Nitin Goyal of The Anderson Clinic in Alexandria, Virginia (very close to Washington, D.C. - about 10 minutes outside the city) and after a great office visit where he explained my problem I went ahead with an anterior approach hip replacement. It was a less invasive operation where he went between the muscles to get into the hip joint rather than having to cut the muscle. I was walking on the day of surgery and left the hospital the next morning! My husband couldn't believe it! I stopped using the cane within a week and was walking better than I had in years by 2-3 weeks after surgery. I would strongly recommend him to anyone that has hip or knee arthritis and needs hip replacement or knee replacement in the virginia, maryland, or washington, d.c. area. The anterior approach hip replacement by Dr. Goyal changed my life! Apparently he also does outpatient partial knee replacement - one of my friends just got scheduled for this through him -- she says she will leave the same day she has surgery! I had a partial knee replaced November 2014 and walked out of the hospital the same day. I couldn't believe how easy the whole experience was. I hardly had any pain and I'm feeling so much better now without pain. Dr. Goyal did a great job and I would recommend him and the entire Anderson Clinic. I had knee replacement surgery performed by Dr. Goyal on my Birthday with much hesitancy about anesthesia and being put to sleep. The knee replacement concept concerned me but not as much as the anesthesia. Dr Goyal listens to his patients concerns and he found a solution to my fear and I was given a spinal tap and my worries were over. I was also concerned about the pain but I was promised the pain level would not be any more than a six. However I must say honestly not only was it no more than a six it rapidly decreased to a 3 after I was released. Six was not as bad as the pain I had suffered before the surgery. Prior to surgery my pain was excruciating, after surgery my pain level was bearable. After two weeks I was using minimal pain medication. Dr Goyal knows what he is doing and my recovery time was amazing. I rode the stationary bike making full rotations two weeks after I was released to a regular physical therapist prior to that I was having home physical therapy. I had not ridden a bike since 1978 so my knee had dictated my quality of life and through surgery, physical therapy, and determination I am looking forward to hiking this spring. I have continued to exercise because I have always loved it I just could not do it. Now I look forward to it. God Bless you Dr. Goyal. I brought my 79 year old friend here 4 months ago and she was barely walking due to severe arthritis in her right hip. This clinic is a well oiled machine!! She had her surgery, stayed in the hospital for 2 days and was discharged home:)) She recovered without any complications. Today was her 4 month check up, Dr. Goyal stated she was "Perfect"!! I can not thank you all enough for giving my friend back a better quality of life! God Bless you all!!!!!! Dr. Goyal replaced my knee 8 weeks ago and I'm already back to hiking and cycling! His bedside manner was so great and he fixed my knee up in a jiffy! Can't imagine having a better experience than the one I had at the Anderson Clinic. I had both of my knees replaced by Dr. Nitin Goyal. He is a phenomenal doctor and I think he really is the best orthopedic surgeon in DC. He did "minimally invasive partial knee replacements" on both of my knees and I recovered quicker than I could have ever imagined. He was so patient with me and my questions in the office and his staff was very thorough. Pat, his nurse, went through things in such amazing detail. Since I wasn't going to stay in the hospital overnight, Pat even gave me all my prescriptions ahead of time so I didn't have to go to the drugstore the night of surgery. I saw his physicians' assistant too, Sarah, and she was wonderful. His staff gave me a temporary parking permit when I needed it and got back to me quickly whenever I called in. All of the hospital staff talked about Dr. Goyal like he was the best knee surgeon in the area and were so impressed with how all of his patients do. Apparently his patients usually leave on the day of surgery.